The constant search for successful cancer therapies lasts for decades. Apart from the huge scientific effort and enormous sum of spent money, only a small amount of newly developed medicines move into clinical use (only 94 registered anticancer drugs in the last 12 years). 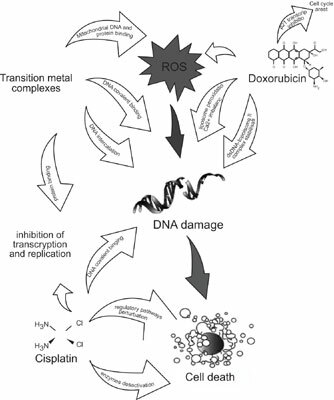 Anticancer regimes are still overcome by drugs invented over 50 years ago such as cisplatin and doxorubicin. Significant progress in the development of improved anticancer drugs was made due to multiple studies on the relationship between the molecular structure of chemical compounds and their cytostatic activity. A number of ligands (mainly organic) with quite effective anticancer properties are known, but they show insufficient activity, selectivity and multidrug resistance. Formation of transition metal – ligand complexes (with proven anticancer effect) changes the properties of the latter. The factors that affect the cytotoxic properties of metal complexes are: the type of ligand and metal, the nature of the connection between metal and ligand, and the distribution of electronic charge density in the formed complexes. Here, we report the recent efforts to improve existing compounds with confirmed anticancer activity. They seem to be unappreciated as their effects appear to be less spectacular than that of targeted anticancer drugs (i.e. based on antibodies or small RNAs). Metal complexes, polyphenols, doxorubicin, cisplatin, cancer therapy, medicine.